Control file versions with this document management system. Is there a better alternative to DocHaven? Is DocHaven really the best app in File Management category? Will DocHaven work good on macOS 10.13.4? Note: DocHaven is free to download and use, but since it stores lots of data on the HMS server there is a rental charge for continued use. This charge is $9 per user per month or $99 per user per year. 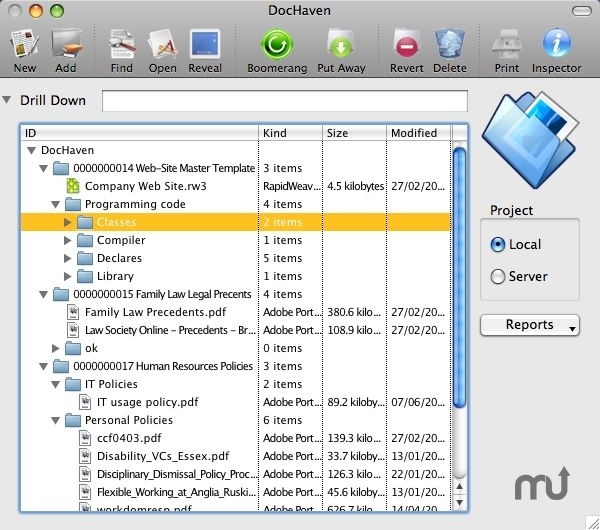 DocHaven is a cloud-based library for your documents. You run it as an alternative to the normal folders on your PC or file server. Your documents are permanently backed up. You take them out of the cloud as you need them, then put them back into the cloud when you have finished with them. [Fix] The Find button on the bottom right of the window now works. [Fix] Cancelling a current transfer now works properly. [Fix] If the current transfer fails mid-transfer it is now set as a fail properly. [New] Zipping updated to v3.3.3 fixing a potential Windows and Linux error. DocHaven needs a review. Be the first to review this app and get the discussion started! DocHaven needs a rating. Be the first to rate this app and get the discussion started! You can store any kind of document in these 'Projects'. Once a Project is back in the cloud it can be taken out by others in your group. Each time a person tries to take out a Project they are verified. They must be either the owner of the Project or a member of the group to which the Project belongs. Your files are in three places 1) your DocHaven folder, 2) the cloud, and 3) your cloud backup. At least three copies, at least two different media, and at least one of the copies is offsite. Plus DocHaven also gives you extra assurance with multiple versions on the cloud and in your backups. Use the Backup window to create an on-site record of all your cloud projects and project meta-data. DocHaven, like the other HMS Cloud products, stores your data on the HMS servers, so you can share your documents with any other users world-wide.